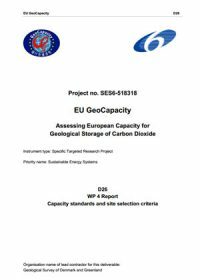 The GeoCapacity project assesses European capacity for geological storage of CO2 in deep saline aquifers, oil and gas structures and coal beds. This publication reports on the site selection criteria required when considering sites for geological storage. It presents a site ranking methodology based on geological suitability for CO2 storage and on data availability and confidence.